A brief clip here from the BBC4 programme The Mary Rose – A Timewatch Guide, the segment featuring the longbows and arrows pulled off the ship, and the testing of one of them to destruction. The actor Robert Hardy, later to play Cornelius Fudge in the Harry Potter films, was part of this project as one of the country’s foremost longbow experts. The warbows found on board were extremely heavy – up to 185lb in draw weight. 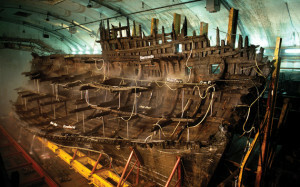 Famously, the scientists managed to identify several likely archers among the hundred plus skeletons found on the wreck, based on their shoulder blades. Anyway, enjoy. ✉ Email me on ???. so, where does your bow come from?